Low & Steady (Turtle Cheesecake Swap)! Today's recipe has nothing to do with hard-shelled reptiles. 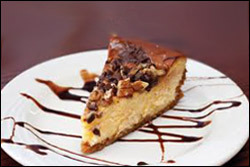 The turtles that inspired this amazing cheesecake are the gooey, chocolatey, nutty candies that are usually really high in fat and calories. Yes, THOSE turtles. Are you ready for this? Preheat oven to 350 degrees. Spray a 9" springform cake pan with nonstick spray. Set out all cheesecake ingredients. Combine cream cheese, sugar, and vanilla extract in a large bowl. With an electric mixer set to medium speed, beat until smooth, 1 - 2 minutes. Continuing to beat the mixture, gradually add yogurt, egg whites, lemon juice, and flour. Beat until thoroughly mixed, about 2 minutes. Evenly pour mixture into the cake pan. Sprinkle with chocolate chips. Bake until firm, 40 - 45 minutes. Once cheesecake has completely cooled, evenly top with crushed graham crackers. 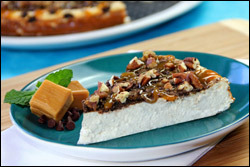 Drizzle with caramel dip and sprinkle with pecans. Refrigerate until chilled, at least 1 hour. Release springform, slice, and dig in! HG Heads-Up: Be sure that the cream cheese, yogurt, egg whites, and lemon juice are at room temperature. This will help to prevent cracks in your cheesecake. HG Alternative: Cut calories and sugar by using an equal amount of Splenda No Calorie Sweetener (granulated) in place of the sugar. Then each serving will have 170 calories, 20g carbs, 12g sugars, and a PointsPlus® value of 4*. We can't think of a person who doesn't need this recipe in their life. Click "Send to a Friend" to start passing it around. Oh, boy -- it's finally National Peanut Butter Day! Read up on some of our favorite peanut butter picks... DO IT.